Win Tea with the Dames: Grab a drink with these iconic actresses | SWITCH. 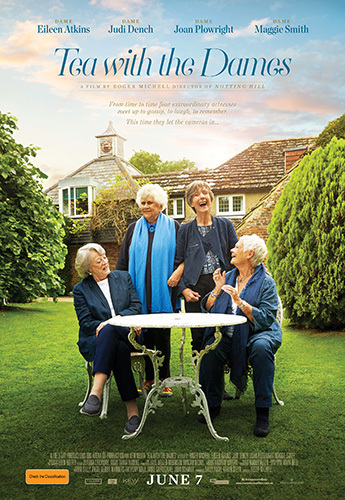 'Tea with the Dames' is a unique celebration of the lives and careers of four of our most iconic actresses; Dame Eileen Atkins, Dame Judi Dench, Dame Joan Plowright and Dame Maggie Smith. All four have gone from being fledgling actresses in the 1950s to acting royalty. They’ve watched each other’s careers grow and bloom and have celebrated life’s ups and downs together. 'Tea with the Dames' invites you to spend time with these acting legends as they talk about their lives and their professional experiences across theatre, television and film. Directed by Roger Michell ('My Cousin Rachel', 'Notting Hill'), the film also includes a range of astonishing archive material. Candid, funny, caustic, irreverent, poignant and utterly engrossing, this unmissable release is proof that there is truly nothing like a Dame. The 'Tea with the Dames' competition has now closed. Winners will be announced shortly. Competition opens at 5pm AEST on Sunday 27th May 2018 and closes at 11:59pm AEST on Sunday 3rd June 2018. Ten winners will be chosen at random on Monday 4th June 2018. To successfully win, entrants must fulfil the above entry conditions before the time the competition closes. Current members/followers are eligible to enter the competition. Only one entry per person. Only one winner per household. To be a valid winner, the entrant must not have won a prize from SWITCH within the last 28 days. Each winner will receive one double pass to 'Tea with the Dames'. By entering, you agree to receive occasional emails from SWITCH in the future. If you decide to unsubscribe from these updates, any further entries will not be applicable. Only Australian residents are eligible to enter. 'Tea with the Dames' is in cinemas from Thursday the 7th June 2018 through Transmission.